Gov. 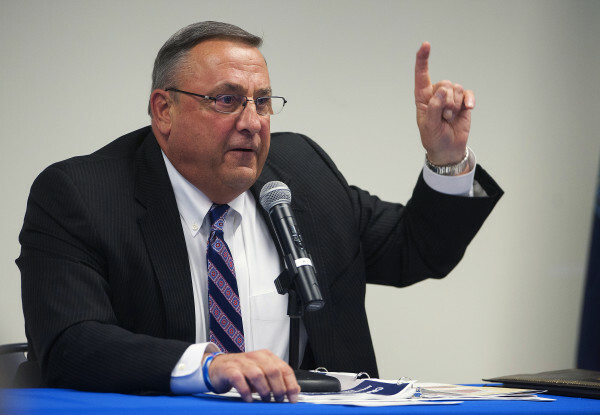 Paul LePage talks at the the University of Maine Hutchinson Center in Belfast April 28. AUGUSTA, Maine — Gov. Paul LePage says he has decided not to nominate any candidates to fill dozens of empty positions on state boards and commissions that issue licenses, resolve disputes and approve agreements. In making his decision, LePage cited tensions between the Legislature and the executive branch, and said he won’t even consider naming possible replacements until January at the very earliest. Toward the end of the last session of the Legislature, LePage withdrew dozens of nominations from consideration by the Legislature, blasting the legislative branch for failing to act on his tax reform proposals. At the time, he talked about resubmitting nominations this fall, but has told MPBN News that he has changed his mind in the wake of bruising political battles with the Legislature. “Too much hatred between the Legislature and the executive branch, so there is a cooldown period until January, and then I will consider putting the judges in. That’s the only ones I will consider putting in,” he said. The two judges are the new positions created in the state budget passed over LePage’s veto. They were created to deal with the increase in drug-related cases anticipated as the result of additional investigators and prosecutors that were also included in the budget. As for any legislation in January, LePage says he’s delegating that to his chief of staff, John McGough. “And if they need me, they can talk to John, my chief of staff, and I will give him the power to do legislating because we have no power up there, it’s that simple,” he said. The governor said he will do what he can within the executive branch to make the changes he believes are needed to effect change, such as the creation of asset tests for food stamp benefits. He says for the rest of his term he will go directly to the people through the citizen initiative process, pursuing a tax reform package and another on welfare reform. Lawmakers have been hearing for weeks that there would be no nominations forthcoming during the usual fall confirmation session. Senate Majority Leader Garrett Mason, a Republican from Lisbon Falls, said it’s unfortunate that the governor is leaving vacancies on various boards. A real estate agent, he said all licensing boards provide important services to Mainers. House Speaker Mark Eves, a Democrat from North Berwick, has clashed repeatedly with LePage on many issues. He said the governor is abdicating his responsibilities by not nominating replacements to the various government boards. And University of Maine political science professor Mark Brewer said if the governor carries through with his promise not to name any replacements, it won’t be long before a lot of Mainers will be directly affected by boards and commissions that can’t approve deals, issue licenses or adjudicate disputes. So far the clearest example is the Land for Maine’s Future board, which has not been able to meet because both replacement members have not been named and because three board members serve in LePage’s Cabinet and have not attended meetings. Brewer said the longer the impasse continues, the longer boards and commissions will find themselves unable to meet and carry out their responsibilities.